This email is from District Ranger Tom Malecek to the Forest Service employees working on the Environmental Impact Statement (EIS) for the Wolf Creek land exchange that would allow for construction of the 8,000-person “Village at Wolf Creek.” Mr. Malecek indicates that the “project proponent,” in this case the developer, Red McCombs, is insisting on a meeting with the Forest Service and the Fish and Wildlife Service because he is unhappy with the proposed process. See the full email chain here. As a party interested in the results of the Forest Service’s EIS, Red McCombs is allowed to inquire about the process. He is not, however, allowed to use his relationships with “higher ups” to influence the project. 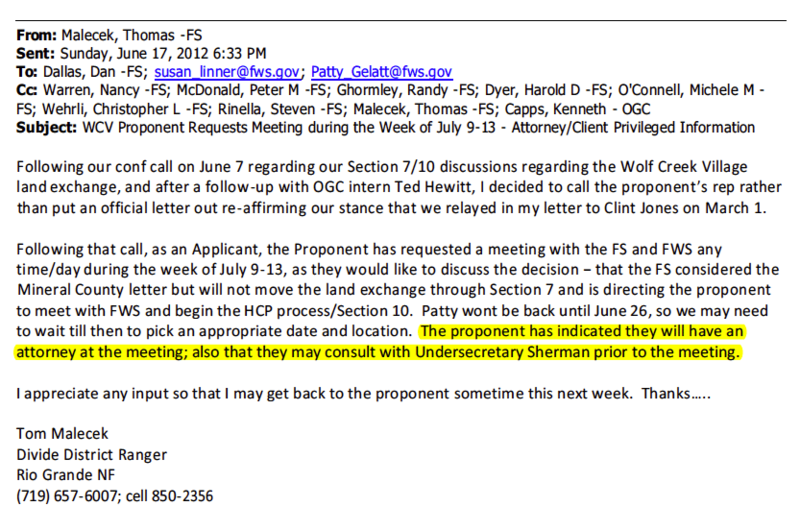 This email suggests that McCombs is threatening to “consult with Undersecretary Sherman” because he doesn’t like the direction the local Forest Service is taking the analysis. We have filed two Freedom of Information Act (FOIA) requests about the Wolf Creek land exchange EIS**. So far, the Forest Service has withheld documents from higher offices, including Under Secretary Sherman’s, on the grounds that these offices had no involvement in the EIS process. This email indicates that Under Secretary Sherman may have been involved. Fortunately, on January 29, 2016, Federal Judge William Martinez agreed with our position and ordered the Forest Service to conduct a reasonable search of Undersecretary Sherman’s office for these relevant records!